WE CAN MINIMIZE THE STRESS AND MAXIMIZE YOUR CLAIM! AND FIGHT DENIED ONES AT NO UPFRONT COST TO YOU! FOR US, NO DAMAGE IS TOO SMALL OR TOO BIG. 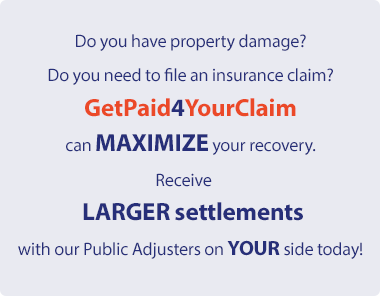 DON'T FILE A CLAIM WITHOUT A PUBLIC ADJUSTER! 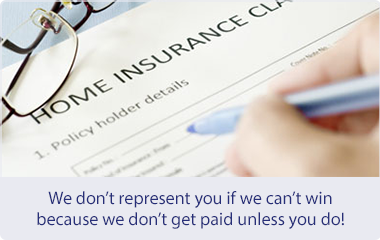 At Get Paid For Your Claim we handle insurance claims on behalf of our clients so they don’t have to. 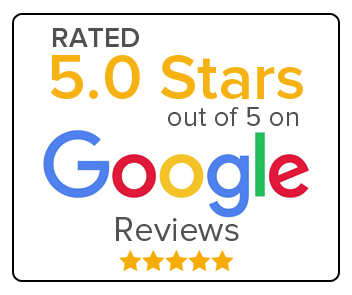 Our service is fast, to the point and gets results. We know what needs to be done in order to get the desired outcome. We know how to strategically move the process along, while negotiating on our clients’ behalf toward the best possible outcome, the maximum settlement available. The insurance company has their own team of experts and adjusters to advocate on their behalf and Public Adjusters work for those insurance policyholders who have been forced to use that insurance to make a claim. The earlier a public adjuster is brought into the process, the better the opportunities are for helping you obtain a more favorable claim settlement. As soon as you engage our team, we swing into action on your behalf. Our public insurance adjusters support you through the entire claim process to achieve the maximum insurance recovery. 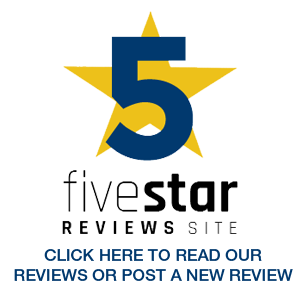 GET A FREE CLAIM ASSESSMENT OR POLICY REVIEW! Save time and hassle of going through the claims process yourself. Having an advocate who knows the policies, the law and the insurance carriers. Have someone fighting on your behalf fighting for every dollar that is rightfully yours. We work on a contingency fee basis so we only get paid when you do. The insurance company also has experienced adjusters who will visit your property to do a damage assessment, but they’re generally looking to pay out as little as possible. The reality is, they are looking out for the insurance company’s interests, and what they can save in payouts adds to their overall bottom line. At GetPaid4YourClaim we look out for your best interests to ensure maximum compensation towards your repair. According to the Florida Legislature’s Office of Program Policy Analysis and Government Accountability-OPPAGA, Policy holders who hired public adjusters (PA) for non-catastrophic claims received 574% more money than those who did not hire a PA. Policy holders who hired public adjusters for Hurricane related claims received 747% more money.